1.9 CDTi Design  5dr [Euro 4] From £2750+Retail package. The Vauxhall Zafira redefined the mini-MPV market when the original version was introduced back in 1999. With a cleverly configurable 7-seat layout and solid design quality, the Zafira rapidly became a popular choice for those looking for a people carrier. The Zafira was significantly overhauled in 2005 and these later models are longer, wider and taller, resulting in more interior space. 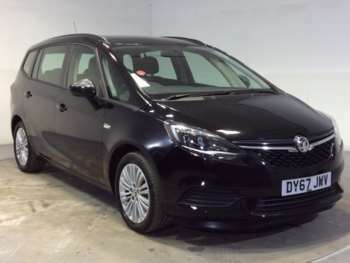 Still a 7-seater, the later Vauxhall Zafira poses as a standard 5-seat model most of the time, with the rear seats folding flat away to give a capacious load space. With this also came an enhanced trim and an even better build quality. What most people are looking for when they buy a mini-MPV is space and versatility, and the used Vauxhall Zafira certainly delivers both. Clever seating arrangements can transform to offer every number of seats from 2 to the full 7. Providing a dynamic driving experience, unrivalled interior comfort and space for 7 people, a used Vauxhall Zafira boasts impressive features and a reliable performance. From the practical Exclusiv model to the funky Design used Vauxhall Zafiras are a first-rate choice for those searching for a large family car to get them from A to B. A second-hand Vauxhall Zafira offers a reassuringly car-like driving experience based on its proven underpinnings. It doesn't roll as much as you might think and is relatively stable through the twists and turns. Refinement and handling are generally good, and although the sportier petrol models deliver quite surprising performance for a mini-MPV, the ride has generally been tuned to deliver comfort over sports car ride quality. The VXR will reach 60mph in 7 seconds and propel you to 144mph wherever that's legal. The more sensible CDTi diesel will get to 60mph in 12 seconds for the 120bhp model while the 150bhp take 10.2. Top speeds are 116mph and 126mph respectively and they drink 46.3mpg for the 120 and 45.6mpg for the 150. Got a specific Vauxhall Zafira model in mind?